Americana dinnerware is very popular in country kitchens. Stars and stripes in shades of red, white and blue make up this Americana décor, along with patterns that feature American classics. The word "Americana" is actually used to describe artifacts that relate to the history of United States - folklore, geography, cultural heritage, and contemporary music that was developed in America. An Americana décor theme is very patriotic and is often used in celebrations of Independence Day on July 4th. A lot of décor based on this theme combines antiques and vintage items with contemporary items to accentuate the overall patriotic appearance. The Star Vine pattern is perfect for an Americana kitchen. Personally, I love this décor and would like to have it in my kitchen and dining room. It's country-style and patriotic without being overly bright. It also goes well with other Americana décor, so it is easy to complement. Fiesta Dinnerware is perfect for an Americana decorated kitchen and dining room. 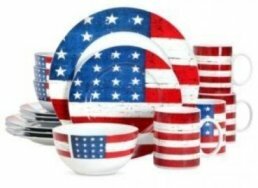 You can mix and match colors to create your Americana dinnerware set. This dinnerware is made in America by Homer Laughlin China Company. They have been making dinnerware since 1871. Many of the Fiesta patterns have become collectibles. There are many shades available with matching serving pieces in the Fiesta line. The rooster designs brings together the country and Americana décor perfectly. Designs by Warren Kimble are renowned in America. Among these is the Gibson Regent Americana 16 Piece Dinnerware Set . This is an awesome set for an Americana kitchen. Traditional Americana patterns can also be used in Americana décor. These versions are elegant with the colonial scenes that represent the heritage of America.